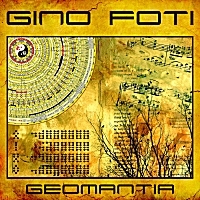 During my last release, I used the element of chance several times to speed up the production process, and to try something different, and thought that producing an album that integrated aleatory music - along the lines of composers like John Cage, Henry Cowell, and Charles Ives - would be both challenging and rewarding. 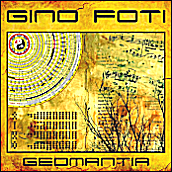 Geomancy, or earth divination, has been used for millennia by many civilizations around the globe, so I considered it an excellent concept for a world fusion release. I used a deck of tarot cards, dice, the I Ching, runes, and the sixteen geomantic figures during the compositional process to choose several primary elements, including: instrumentation, musical forms, number of improvised measures, tempos, time signatures, titles, and tonalities. Last time, I purposely left out keyboards and synthesizers, and now that they were back in the mix, I threw a die to see which instrument would be omitted in their place, and classical guitar was selected. I rolled again for a geographic area of influence to be excluded, and the sub-continent of India was picked. So, is this project purely concept art? No. Musical content is always of the utmost importance to me. Unlike Cage and his ilk, who argued for removing personal control from music, albeit rhetorically, I simply explored the dichotomy between design and chance, in order to add different colored strands to my sonic tapestries. In my notebook of potential ideas, a trilogy written in different time signatures (or odd meters) had been sketched in for years. With Fate as my co-writer now, I thought it would be interesting to use geomancy to decide which ones to use. To make things even more challenging, I decided to compose a miniature trilogy within a trilogy, for the fractal aspect inherent in sacred geometry. The time signatures chosen were 10/8, 9/4, and 9/8. I also rolled the dice for geographical/stylistic areas, with the results being: the Middle East, the Mediterranean, and Celtic music. I began working on this part by coming up with a chord progression that balanced both major and minor keys/modes, since the principles of sacred geometry of the Ancients constituted the basis of harmonic proportions, or the essence of the created Universe, found in both ourselves and in Nature. This natural progression follows a summation series, usually referred to as the "Fibonacci Series", after Leonardo Fibonacci, or Leonardo of Pisa, an Italian mathematician born hundreds of years ago, although the series and patterns have been well-known to cultures as far back as Ancient Egypt. a.) 10/8 was a natural for The Tree of Life, a geometric power symbol that has been used to represent both a diagram of the human psyche, as well as a struggle between light and darkness - or in my musical terms - major and minor scales. The structure is directly connected to the Kabbalah, with its 10 Sephirot (Sefirot), or divine attributes/emanations, that can be viewed in nature in various patterns that encompass or derive from the "Flower of Life". The 3+4+3 rhythm I chose was partly influenced by Jewish folk music, for the obvious reason, and acoustic piano is the dominant instrument for this section. b.) Given the 9/4 time signature and Mediterranean area chosen for the middle section, I thought that a Greek doumbek rhythm would be optimal. I recalled the mythological tale of Zeus releasing two eagles at opposite ends of the world, and commanding them to fly across the globe. They finally meet at Delphi, where Zeus places the omphalos stone to mark the center of the earth. Throughout the ancient Mediterranean, omphalos stones were powerful symbolic artifacts that marked the "navel of the Earth", the geometric center from which all terrestrial life originated, according to that culture and its spiritual/religious beliefs. Musically, I used a chromatic chord progression that also oscillates from major to minor, and added panned "airy" synth vox to represent the eagles, with fretted bass guitar as the featured instrument. c.) The ending part in 9/8 Celtic music proved to be very challenging for me, since I had never composed in this style, and also needed to come up with material that made musical sense with the previous two sections. The first thing I actually did was to come up with the title, after doing some research, hoping it would inspire me. Uisneach is a special place, with a rich history in both Celtic mythology and sacred geometry. Aill na Mireann, or the Stone of Divisions, found at the heart of Uisneach, marks the "navel of Ireland". It is commonly called the Cat Stone, since its overall shape resembles a cat crouching over a mouse. It is said to be the burial place of the Goddess Ériu, from whom Ireland, or Eire in Gaelic, got its name. It is also connected with ley lines and sacred geometry. According to legend, it is where the five provinces of Ireland met, the fifth being Mide in ancient Ireland, which was accessed through the Cat Stone, referring perhaps to a mystical gateway to the "other world". In addition, it is closely connected with the ash tree. The "Branching Tree of Uisneach" planted by Fintan the Ancient was an ash, sacred to their sun god Lugh, and referred to as the "Tree of Enchantment". Since The Tree of Life is said to also be an ash, this completed the piece conceptually for me. Musically, 9/8 was perfect for a Celtic waltz rhythm, and I was fortunate to find an excellent set of bodhrán samples - the traditional Irish frame drum made with a wooden body and a goat-skin head, played with a double-headed stick called a cipín - to use as the heartbeat for this section. I used fragments of chord progressions from obscure Irish music, and dovetailed ideas from the first section to come up with both an elegant and elaborate bed for my fretless bass to solo over. To tie the entire piece together, I reintroduced the main melody from a. ), this time in 9/8, as a call-and-response section between piano and fretless, and with a slight variation for the outro/ending bass guitar part. The four duets sans percussion on my last release were well-received, so I decided to continue the series by composing one with bass guitar and piano, whose combination I had yet to use. Through chance, the number of themes, tempo, and geographic area of inspiration were chosen, which turned out to be: three, 115, and China. I also added some slight variations to the main themes, and to the tempo through the use of rubato, for better flow throughout. The title translates to "Azure Dragon, White Tiger", two of the ancient pan-Asian mythical animals predominantly featured in Feng Shui, a form of geomancy... well, at least a close relative. In China, geomantic lines of magnetic force, known as lung-mei or "dragon currents", exist in two forms: the positive Yang, represented by the green-blue dragon that protects the East, and the negative Yin represented by the white tiger that protects the West. In landscapes, steep mountains and sharp rocks are considered yang, or male, while gently undulating country is yin, or female. There are many other related, as well as esoteric, connections between these two figures who are often visually presented as if in conflict with each other, in order to dramatize the balance and harmony produced and maintained in nature through the antagonistic union of opposites, which is what I tried to represent sonically with this piece through the interaction of both instruments. "The earth's condition is receptive devotion. With the heart of compassionate yin. For this composition, I "consulted the I Ching oracle", and "the answer" was hexagram number 2: K'un, The Receptive Earth. The I Ching, or Book of Changes, is a common source for both Confucianist and Taoist philosophy, represented by 64 hexagrams, archetypes that comprise all the possible six-line combinations of Yin and Yang, the fundamental duality of the Universe. Each hexagram is a combination of two trigrams, so a two-part suite was in order. Since K'un is made up of six broken lines, I chose six-note motifs as the main idea for the the second part of the piece. The six broken lines are supposed to represent the dark, yielding, receptive primal power of Yin, or female energy, which inspired me to use a Chinese female voice over a "breadth of character" synthesizer bed for Part I, and Asian influenced melodic and "compassionate" acoustic piano parts over a drum kit and bass guitar rhythm section, representing "assertive strength" for Part II. I wanted to compose another trilogy for this album, but due to its conceptual nature, a standard trilogy was out of the question, so I decided to use the "triune aspect" idea from my last release as a point of departure, and write three pieces with different instruments, all in free time, or tempo libero. The instruments, musical content, and even the titles would be derived through chance via a tarot card, an I Ching hexagram, and a geomantic figure. Over a hundred compositions & arrangements to my credit, and I had yet to publish a solo bass guitar composition, so this was the ideal time to do so. With three different basses to choose from, a clean/DI fretted bass guitar was picked for me, and the tarot card I drew was IX, The Hermit. The key themes of this card, according to my online research, are: detachment, guidance, introspection, reflection, solitude, and soul-searching, which I found to be ideal, since the introspective nature of the card's meaning would allow me to compose real music, bypassing the temptation of trying to elevate my chops into art. To make things more interesting, I used chance to add a time signature change, which turned out to be 6/8. Since I am quite fond of this meter, I ended up writing the whole piece (minus a measure or two) in six. The main theme and its variations were influenced by Asian folk music. The secondary themes and chord progressions were influenced by European Classical and Mediterranean folk music, to give the overall piece an East-meets-West vibe. Inspired by the writings of Swiss psychiatrist and psychotherapist Carl Gustav Jung. Jung used the term syzygy (usually used to denote alignment of planets) to describe the combination of two archetypes, the animus and the anima. In very basic terms, the animus represents the male aspect of the female psyche, and viceversa. Together, this "divine couple" combine to represent the Soul, or our true Self, as opposed to the various masks and disguises that we display to others. I decided to use a structured piece for Part I, and the attributes chosen by chance would also be used for the second part to create an improvisational piece. My starting points were: the Mediterranean for geographical area of influence, 7/8 for odd meter section, fretted bass guitar as rhythm instrument, acoustic piano as lead instrument, and drum kit for percussion. After the usual period of trial and error, I settled on a piece that has a progressive rock rhythm section underneath a jazz-rock fusion piano playing pan-Mediterranean themes and chord progressions. One of my favorite pieces on this release. The main title is Latin for "the soul (or spirit) that animates a place (or location)", or the personality of a specific place in Nature, commonly found in several cultures around the world, most notably in animistic & shamanistic traditions and religions. The belief is that natural forms, such as: mountains, lakes, rock formations, pools, etc. are sacred spaces where it is possible for human beings to be in contact with the Divine. One of the most prominent venerable places throughout Europe and the Near East for thousands of years was the sacred grove, or bosco sacro. In ancient Mediterranean cultures, the physical concept of temenos, referred to a protected territory or sacred space reserved for worship of the gods. For example, Mount Olympus was Zeus’ temenos to the Greeks. Jung used the term to refer to a safe haven within us, an inner sacred space where soul-making takes place, resembling geomantic "squared circles", like mandalas, in which an encounter with the dark unconscious can be brought safely into the light of consciousness. While these spaces provide protection, and we can be ourselves without any fear, they also invite a deeper connection with nature, or the Source. This piece opens up with wooden flutes and hand percussion, with added nature soundscapes transitioning to an aural mandala - a static chord progression underpinned by a Mediterranean rhythm in 7/8 meter, chosen for me in Part I - with a fretless bass playing various themes and ideas. With a circular background, and Part I being subdivided into multiples of 8 bar sections, I used uneven measures, with some themes being 5, 6, or 7 bars long to purposely steer away from the normal 16 or 32-bar solo format, hopefully making this piece more interesting to listen to. Medicine wheels, or sacred hoops, are stone structures constructed by the native peoples of North America for various purposes, usually for ceremonial, healing, ritual, teaching, as well as astronomical uses. They are meant to represent the balance between powers in Nature and in the Self, a type of shamanic compass that can help one find their way, their direction in life, and to attune themselves to the natural forces and energies of Earth. The word medicine is obviously not meant in a medical sense in this context, but refers to the vital energy or force that is inherent in Nature itself, and to the personal power within oneself which can enable one to become more whole or complete, as to most Native American peoples, the wheel (or to be more more precise, the circle) represents Wakan-Tanka, the Great Spirit, or the Universe, as well as one's own personal space. They are usually constructed by laying a central cairn, with one large or special center stone, and four smaller stones to represent the cardinal directions, and surrounding it with an outer rim of stones, with lines of rocks emanating from the center connecting both, like spokes on a wheel. The Cheyenne version sometimes used a large buffalo skull for the center, and was a place to make prayer offerings, and/or atonements for any offenses caused to Mother Earth. Musically, I used panned guitars to play a polyrhythm of 4/4, for the central cairn & cardinal directions, versus a concentric circle of 5/4 - chosen through a roll of the dice - with a bass guitar radiating lines outward and connecting both time signatures. The 4/4 guitar was partly influenced by flute music from the Lakota tradition. Since the overall concept of this album was influenced primarily by John Cage, who used the I Ching as a standard tool for most of the works he composed after 1951, a free-time acoustic piano piece was appropriate for this project. The hexagram I drew was number 29: K'an, The Abysmal Water. The meaning(s) and interpretation(s) of this hexagram are too numerous to mention here. Basically, the lesson is that only when you learn from danger, will you triumph over it. According to various web pages: "Through repetition of danger we grow accustomed to it. Water sets the example for the right conduct under such circumstances. It flows on and on, and merely fills up all the places through which it flows; it does not shrink from any dangerous spot nor from any plunge, and nothing can make it lose its own essential nature. It remains true to itself under all conditions." and "The positive side of danger is that it offers an excellent chance to cleanse the senses and strengthen the spirit. Surviving danger brings with it tremendous reinvigoration, and sharpens the eye and mind for future challenges." Given all of the above, this composition flows through several dark themes, with one of them being repeated with a slight variation towards the end. Since the arrangement was "complete", as I could not edit or mix any individual instrument, I was left with very few choices to add chance to this piece. With no guitar solo, a rune casting (paying homage to Dave's Finnish ancestry) would pick which instrument would replace it, and fretless bass was chosen. For the second solo, the choice was to use the material I had written years earlier, write new material, or use a hybrid of the two - which is the equivalent of what was cast. After both solos were recorded, I added some congas and doumbeks to the respective parts for some ethnic spice, since the drum programming was purposely left sparse by Dave under these sections. Given that this began as a file sent through email almost a decade ago, and that there was no way for me to do a proper mixdown, the end result isn't all that bad. It's a brief glimpse on the path we were headed on. The title refers to the flowing earth currents that result from both natural causes and human activity, and their interactions in complex patterns. These currents are low frequency electromagnetic waves that travel over large areas at, or near, Earth's surface. Although actual scientifically detectable phenomena, they also appear in geomancy as: dragon currents, serpent lines, ley lines, spirit roads, fairy paths, and many other esoteric names. Soon after Telluric Currents was completed, I felt the need to write something as a tribute to Dave. I began composing a new piece, but it was more meaningful for me to do something with Dave. While listening to his solo albums for inspiration, it suddenly occured to me that there was still one composition that we could both work on: the last track of his debut album, which had no bass guitar! Dave wrote on his blog, at the time: "Spent the long weekend working on 'The Water Discipline'. This song is based on a section that was cut from 'Seven Falls, Eight Rises' on the last Electrum CD. I elected to give it a sort of ambient trip hop groove. Being my first time venturing into that arena it took forever to get the feel and sound of the drum parts right. Then I decided to take the keyboard part which used to have a classic synth pad sound and arrange it for strings. That effort paid off huge as the strings bring a ton of richness to the piece. I've tracked the guitar synth and acoustic guitar parts. All that is left is the electric guitars which I should get tracked during the week. I think I'll skip bass guitar on this since the string double bass and cello should cover the bottom end." Once again, the composition was complete, so all I could do was add bass guitar to the arrangement, hopefully without ruining Dave's work. There was also the aleatory aspect to consider as well. My choices were to: use a fretless bass and go in a jazzy direction, use a "dirty" fretted bass with a symphonic/prog rock treatment, or use a clean/DI bass that blended both styles, which is what was picked through a rune casting. The recording session turned out to be as difficult as it was emotional. It took much longer to record my part than I had planned on, as simultaneously playing an instrument and engineering its audio is demanding enough without tears blurring one's vision. The mixdown session was even more difficult, as the acoustic bass and cello covered most of the same frequencies as my bass guitar, but I think I managed to find a solution so most of the nuances of all the low-end instruments can be heard, as well as felt, by the listener. A new title to fit the concept was needed, so I used a tarot card from the major arcana, since they are packed with symbolism. The card I drew was XIX, The Sun. (Excellent!) I think it took me about three nanoseconds to come up with a title, complete with appropriate Rush lyrics, continuing the thread/inside joke of our past collaborations. This tribute piece is obviously dedicated in his loving memory. Trinacria is both a symbol - a triskele, or triskelion, design with the head of the gorgon Medusa in the center, surrounded by three bent running legs, and three stalks of wheat - as well as the ancient Greek name for my native Sicily, since it used to be part of Magna Graecia, after the three capes and triangular shape of the island. I had never arranged a medley before, so I thought the timing was right. My original idea was to throw a die and have Fate choose a country whose music I was unfamiliar with, but once I started thinking about how much time I would have to devote to just this one track, I decided to use my birthplace instead. Conceptually, it made more sense anyways. I came up with a list of sixteen songs - some that were my favorite, some that were my mother's - assigned them to the geomantic figures, and then drew several to base my arrangement on. After arriving at tempos and key signatures that would work well from beginning to end, I organized the medley by time signatures, starting with the ones in waltz time (3/4), and ending with the ones in common time (4/4), including some "march" time (2/4), and alla breve (2/2). By far, this was the most fun I have had in years in arranging a piece, and even though most listeners will only pay attention to the melodies being played on piano, the bass guitar score is one of my favorites on this album, and maybe one of the best I have ever written. This arrangement is dedicated to my mother. An arrangement of the traditional Japanese "Cherry Blossoms" song for piano and bass guitar, picked by chance from a pool of traditional songs from around the globe. The original melody uses a pentatonic scale and is believed to date from the Tokugawa or Edo period (ca.1603-ca.1868). It was primarily used by beginning koto students, but over the centuries, it has been arranged countless times on many instruments, since it spans a limited pitch range. In Japan, the blooming of the cherry blossoms coincides with the beginning of schools, new fiscal years for businesses, new jobs for recent graduates, and other aspects of their spring canon. Japanese people celebrate with hanami, literally "viewing flowers", which almost always refers to sakura, or the cherry blossoms. My title translates to “night cherry blossoms”, or hanami after sundown. With a minor tonality, the low frequencies of the bass guitar, and an arrangement that includes European Classical and rock elements, I wanted to associate it with the "darker" aspects of this tradition. The number of themes, variations, styles, etc. were chosen by dice rolls and I Ching coins, and I used a version by classical guitarist John Williams as a point of departure for my arrangement. I really enjoyed working on the two duets that featured the shamisen on my last release, so I decided to leave a spot open on this album for another composition that showcases this Japanese fretless lute. The others were arranged in common time, one key signature and one tempo each, so I used geomantic devices to add time, key, and tempo changes. The time signature chosen was 6/8. Since I already had a few compositions in this meter, I opted to write a section that switches back and forth between 6/8 and 4/4 to make it more interesting. The number of tempo changes chosen for me was twelve! (What the... ) With only five minutes or so to devote to this piece, I solved this potential disaster by adding accelerando and ritardando to the second shamisen solo, to maintain overall song flow. As usual, I was not completely satisfied with the arrangement, so I decided to add synthesizers, and delete a bass guitar section, to give the piece more of an East-meets-West fusion flavor, as well as adding some intangibles that would work well with the subject matter. The title refers to "divine revelation", or a prophecy communicated by a possessed person serving as yorimashi or saniwa - a medium for a kami, or spirit, a Japanese tradition that dates back to their shamanistic Jomon era, over 10,000 years ago. Centuries ago, Miko, or female shamans, performed spirit possession, or kamigakari and takusen as functions of their service in Shinto shrines. They eventually left the shrines and worked independently in secular society. Today, Miko at shrines perform a transformed Shinto kagura dance ceremony, called Miko-mai or Miko-kagura, that originates from kamigakari. 'Ilm al-Raml is the Arabic name for geomancy, which translates to "the science of the sand", or more poetically "the wisdom of the sand", as geomantic figures are created by casting lines of random numbers of dots in the sand. Part I is a ney (or nay) solo over a field recording of the vast and barren desert called Rub' al-Khali, or the "Empty Quarter", the largest area of continuous sand in the world, occupying more than one quarter of Saudi Arabia. The ney is an end-blown flute with a distinctive sound that is thousands of years old, and the prominent wind instrument in Middle Eastern music. The background audio captures the south westerly Kharif wind during monsoon season. The title for Part II is one of the numerous epithets of the ancient Egyptian god Set (or Seth), probably the most interesting deity in not just the Egyptian pantheon, but of all mythologies. Over the ages, he has been regarded as both good and evil, with his red hair, unusual facial features, and forked tail probably making him the model for the Biblical Devil. He is best known as an usurper, committing the fratricide of Osiris, and attempting to murder his brother's son and adversary Horus (or Hor). While Set was lord of the red lands, or sands of Lower (Northern) Egypt, Horus was the ruler of the black lands, or fertile soil of Upper Egypt. Fierce rivals for most of their lives, when the two lands became united, Set and Horus were often depicted together crowning the new Pharaohs. Since Set was a god of thunder, a bass-heavy arrangement was appropriate. Over a bed of modern Egyptian tablas (or doumbeks), I added two four-stringed was scepters, determined by chance: slap and pop, playing mostly in rhythmic fashion, and a fretted adding mostly melodic and harmonic interest, with some jazz-funk aspects thrown in. Set was also a god of chaos and confusion, so the percussion lead breaks appear at more random points in the arrangement, along with some added syncopation. After the preliminary arrangement was completed, I went back and added some call-and-response between the two bass guitars, symbolizing The Contendings of Horus and Set - a mythological story from the Twentieth dynasty of Ancient Egypt found in the first sixteen pages of the Papyrus Chester Beatty I, which deals with the battles between the two gods to determine the successor to Osiris' throne. For the last part of this trilogy, a synthesizer was chosen, and the geomantic figure I drew was Conjunctio, Latin for "The Conjunction". The figure resembles a crossroads or a joining of two figures, shown as a geometrical shape of two tetrahedral pyramids with the apex touching. At the time, I was re-reading books by Jung, whose late works and writings focused on alchemy, and I recalled the sacred marriage archetype, often referred to as the "hieros gamos", which according to the Rosarium Philosophorum was defined as the holy wedding between Sol (the Sun King) and Luna (the Moon Queen). This gave me the idea to write several miniature individual pieces, and then blend them together through panning schemes, until I found a couple that worked well together. It proved to be a new, interesting, and challenging way to write a composition. I also chose the key signature through chance, with the result being A minor. The tetractys is a sacred geometric pattern that dates back to the Ancient Greek philosophers and mathematicians who followed the teachings of Pythagoras. As a symbol, it is composed of ten dots in an upward-pointing equilateral triangle formation based on the four essential numbers: 1 as the apex, 2 and 3 as the middle levels, and 4 as the base, with the sum resulting in the "perfect" number 10, a unity of a higher order usually referred to as the Dekad, Decad, or the Mystic Tetrad. This four-fold pattern was considered by Pythagoreans to be sacred, permeating through the natural world as the four primary elements: earth, water, air and fire; and in their view of both Microcosm and Macrocosm, the first two levels of the tetractys represented the invisible & metaphysical world, while the lower two referred to the realm of physical phenomena. Musically, the harmonic ratios of the numbers resulted in perfect consonants: the unison, the octave, the fifth, and the fourth. The Pythagoreans believed that tuning to these intervals gave music a healing power which could harmonize a body that was out of balance. Given the geometric pattern, a 6/4 time signature for this piece was the obvious choice. I opted for a basic ABAB structure with the bass guitar as the lead instrument for the first half, and acoustic piano for the second. Stylistically, jazz-rock fusion is prominent in the first half, and European Classical in the second. The chord progressions I came up with are a blend of both styles. With the piece sounding more like jazz-rock than world fusion most of the time, I added Latin percussion (agogo bells, cabasa, congas, and timbales) to the drum kit arrangement, after the first run-through. The piano parts of the second half, heavily influenced by Johann Sebastian Bach and Antonio Vivaldi, are my favorite on this release. As a tie-in to Part I, the ten points of the tetractys have also represented the ten Sephirot (Sephiroth), or the ten faces of God, in Kabbalah.